Her Search For Her Mother Touches An Entire Chinese City : Parallels Jenna Cook returned to China at age 20 to search for her birth mother. What she found, above all else, was the collective pain of dozens of Chinese families who had given up children. Jenna Cook created this poster when she left her home in Massachusetts in 2012 to return to Wuhan, China, where she had been abandoned as a baby. She hoped a relative might see the poster. She ended up meeting with 50 families who thought she might be their daughter. 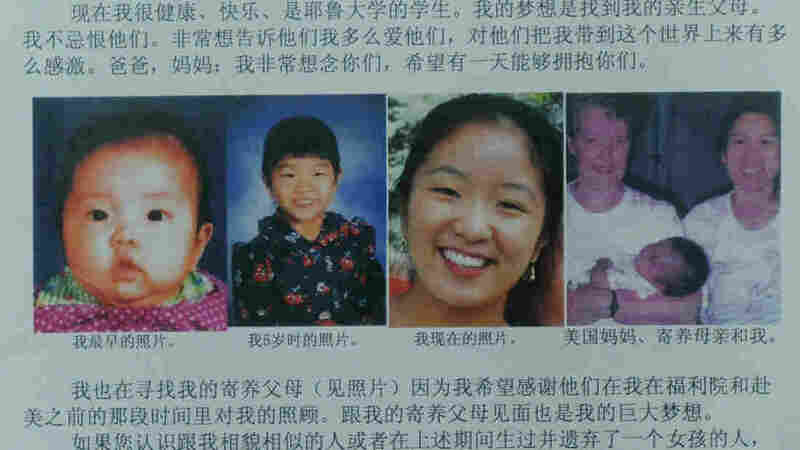 Jenna Cook was born in China and abandoned on a street in the huge city of Wuhan in 1992 when she was just a baby. Cook was adopted by a single American woman, a schoolteacher in Massachusetts, and later co-adopted by her godmother, who is her mother's partner. Cook was accepted at Yale University, and at 20, she decided to go back to Wuhan in search of her birth mother. A local newspaper in Wuhan wrote an article about her, touching off a strong response in the city and far beyond. Cook says she was contacted by people in every province in China. Some said they had given up children and others said they were simply taken by her quest. Cook ultimately met with 50 families to see if she was their daughter. In those talks, she discovered many things, including the collective pain of Chinese families who had given up children. In most cases, the families had wanted a boy and decided to give up the child when it turned out to be a girl. 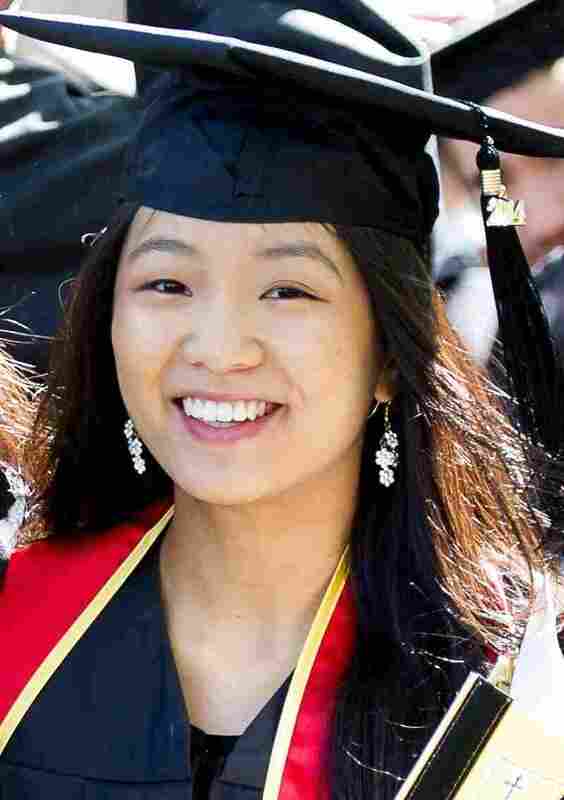 Her efforts in China became her college thesis at Yale and an article in Foreign Policy. She spoke about her experience with Morning Edition host Steve Inskeep. Maybe it was really naive of me, but I was hoping that maybe somebody would see my face and think, "Oh, she kind of looks like my cousin," or something like that. Like maybe my own body could serve as a type of evidence of my family, of where I come from, my own genes. I also ended up publicizing the story in Wuhan through the newspapers and through the television. In the end we met with almost 50 families that summer. So we heard 50 different stories, and I imagined that it would be mostly women, but I was definitely wrong. There were birth mothers who came alone, but there were also many birth fathers who came alone, and some families brought like the entire family. There would be moms and dads with the grandparents and then other siblings and then the grandkids. There would be like eight or nine people in the room. It was really incredible. If I had to kind of extract one coherent narrative, I think they talked a lot about missing this daughter and they really worried about her. They wanted to know if she had survived and if she was OK — kind of like people coming out of a war or refugees or someone emerging from a large disaster and just wondering if the other side had also survived as they had. One birth mother brought a piece of cloth. She had used the cloth 20 years ago to sew a baby suit for the day that she and her daughter would part. And then she hoped that if she and her daughter were to reunite later, her daughter would have the baby suit and then she would have the scrap. It would be kind of like a lock and key. But I definitely didn't have such a baby suit. For most people it was the combination of needing a son, wanting a son, and also the fact that they already had so many children. I have to say, it was surprising, because in the U.S. we hear "one-child policy," we think, "Oh, there's just one child that the families kept." But I don't think I met any families with one child. They all had like three, four, five, six, seven or even eight children, and there was a pattern in that most of the children of higher birth order were female and then they would keep having children until they had a son. And so the missing daughter was usually not the first daughter. They would usually keep that one. The missing daughter was usually the second, third, fourth, fifth, sixth, etc. I didn't. But I feel like going through the search and listening to the different stories has given me some idea of who they might be or what kinds of things they might have confronted. I am still looking but in a less active way. My DNA was left at a local police station. I figure I just kind of leave it up to fate. I put one copy of the search poster in my file at the orphanage. It was like the first 30 pages were all other people writing about me, this small infant with no voice and really no ability to choose her destination or fate in the world. And to be able to come back 20 years later with a search poster that I had written about myself and to kind of add that in as the last page, that was really something that felt satisfying.